The Double GTA$ & RP Inch By Inch Playlist is just one of many bonuses & discounts live in GTA Online from today through to Thursday April 28th as part of High Life Week in GTA Online. All week long take advantage of Double RP Bonuses and substantial discounts for Properties, Yachts, clothing, Weapons, and more! Get your ship together this week with huge discounts from Docktease on Yachts and Yacht customization options. 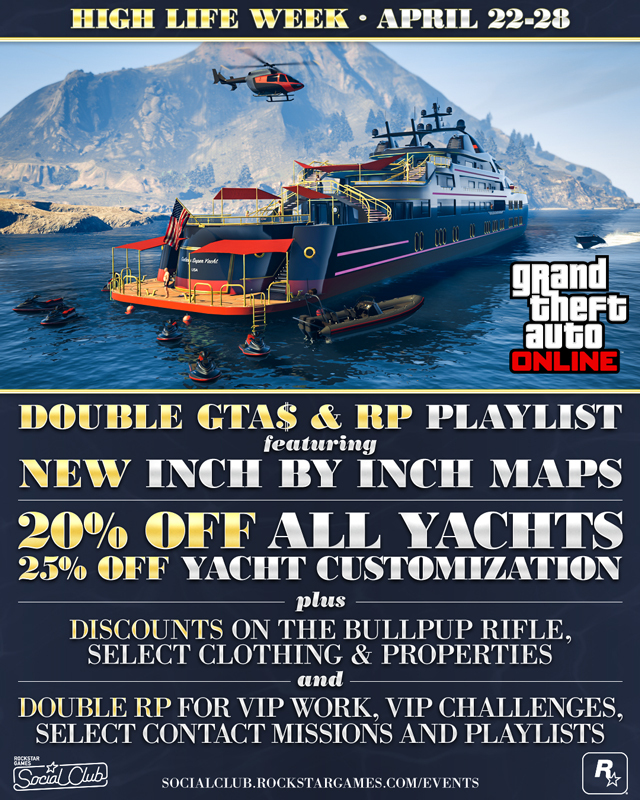 This is your week to save big, whether you wish to expand your fleet with the mighty Aquarius, or purchase the more modest Orion and finally join the upper crust of Los Santos high society cruising the glittering seas around Southern San Andreas. The luxury of these towering status symbols feel just as good as they look, and open up opportunities to play the Piracy Prevention VIP Work, or simply take in the ocean blue from the hot tub. It’s a buyer's market this week for the Los Santos real estate industry, with the most exclusive cribs available at 25% off for a limited time only. All Stilt Houses & Penthouses released with Executives & Other Criminals are discounted, as well as every single Garage property in Los Santos County & Blaine County. Whether you’re looking for a little pied-à-terre in the city, or a home away from home in the Rockford Hills you deserve to rest your head in luxury. Freshen up those threads and find some accessories befitting the life of a Portola Drive high roller with 50% off select clothing in GTA Online. This includes all of the beautifully made Suits, Jackets, Pants and Shoes from the High Life Update, a range of accessories like chains and cuffs, in fact everything you need to dress for success. Head on over to Ponsonbys, Binco or Suburban and let the world know you mean business. Whether you’ve splashed cash on a new property, outfit or sea-faring vessel, such finery is sure to attract greedy and jealous eyes who may look to get their piece of the pie. Protect yourself (and your fabulously dressed loved ones) with 50% off the Bullpup Rifle from your friends at Ammu-Nation. This shooter from The High Life Update is light as a feather but still packs a punch, distributing lead at a feverish pace - pick one up this week at an excellent price. Not only that but you can also earn Double RP playing any of the VIP Work or VIP Challenges with your organization as well as the slew of Contact Missions that were released as part of the High Life Update! 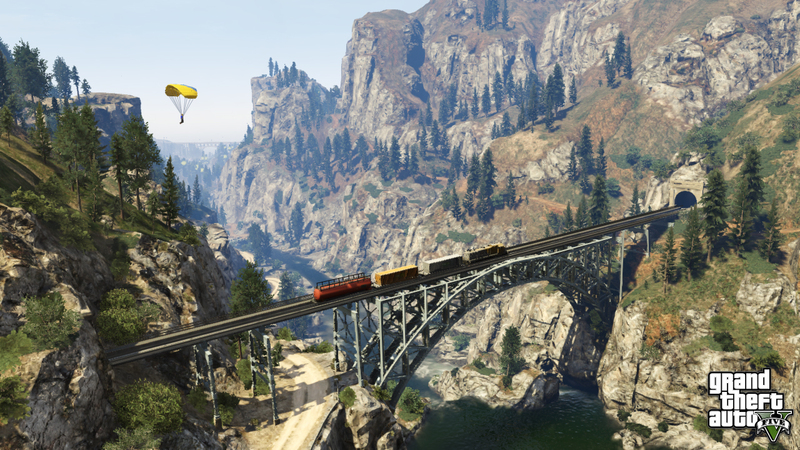 The relentless intensity of Inch By Inch climbs another two notches today with brand new maps available to play right now in GTA Online. You'll be fighting tooth and nail amongst the muck and hay bales at the Grapeseed Cow Farm in Inch By Inch III or setting up security checkpoints for low flying bag carriers entering your end zone’s airspace at LSIA in Inch By Inch IV. Both of the new maps feature in the Double GTA$ & RP Playlist available to launch directly from GTAV boot screens all weekend until midnight on Sunday April 24th. 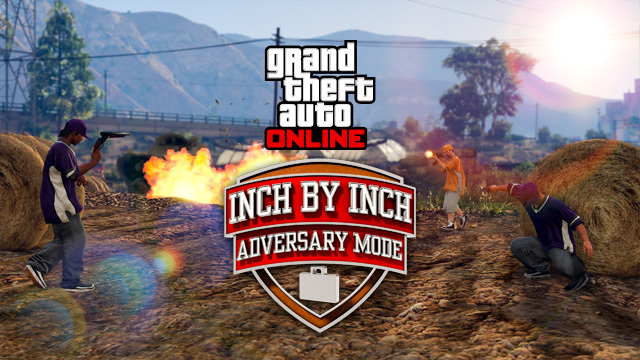 High Life Week & Two New Inch By Inch Maps - Of course another week of discounts and bonuses in GTA Online for new-gen plus two new Inch by Inch Adversary Mode maps.